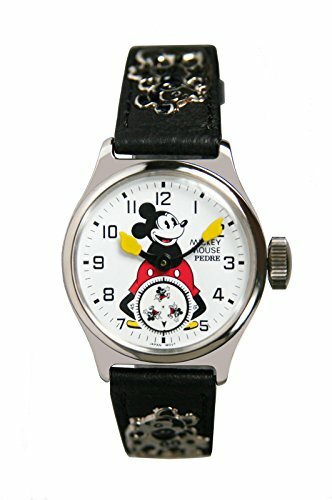 In 1991, Disney contracted with the Pedre Watch Company to produce official exact quartz reproductions of the first and most important Disney watch ever made: The Ingersoll 1933 Mickey Mouse Watch. This is a reproduction of the Mickey Two (the leather strap version). The only difference is that Pedre's name replaces Ingersoll's on the dial and box. Watch is in mint condition and has never been worn. It has been tested and runs great. A brand new battery will be installed as soon as your order is received. Limited edition! Each watch has a unique serial number on the case back. Even the 1933 box has been reproduced, with Certificate of Authenticity signed by the Disney Archivist. Second hand rotating disc at 6:00 features 3 "running" Mickeys. Black genuine leather strap with die-cut and blackened metal Mickeys attached. Case size is approximately 1 and ¼ inches in diameter (31mm). The size of the case is more suitable for women and teens, but a man could wear it if he doesn't mind a smaller size. This is a beautiful reproduction if you can't afford an original Ingersoll. *Ships Free via USPS First Class Mail within the U.S.A. *SPECIAL OFFER: To celebrate Mickey's 90th birthday, you get a free, mint condition, working Mickey & Minnie Cadillac watch (see image). Please note, this free watch does not come in gift packaging. This deal is for a limited time only. Disk at 6:00 rotates every second. Precision Japanese quartz movement. Stainless steel caseback. Comes in a gift box with certificate of authenticity.